The book of the poet who conquered an entire country in less than three minutes. The Souls of Brandon is a compilation of short stories and poems about love, loneliness, forgetfulness, pain, joy, happiness, life and death. An exquisite and bittersweet journey through the senses that will overwhelm you and make you reflect on life. Poetry has won the third edition of the TV Show Got Talent Spain. 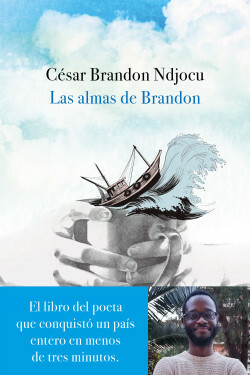 César Brandon, 24 years old and from Equatorial Guinea, has fascinated both the jury and the audience of one of the most watched Spanish TV shows. Brandon went to the show with the desire to «fulfill a dream». «Since I was little, my passion has been writing. It's hard, but it's my passion, so whatever it costs, I have to keep moving forward», he said in his presentation. «I think people had no idea of what I was going to do, they probably thought I was going to sing, rap or dance». But, no. He stood in front of the public and recited an original poetry about the numbers 0 and 1 that brought the audience to its feet. César Brandon has become a phenomenon in less than three months. He is the spearhead of a new generation of young poets, millennials, born on the Social Media era and lifted by Social Media. The poetry that use to come out on paper, now jumps directly to all the screens that surround us. Poetry is no longer only read, it’s also recited, recorded, filmed, and shared.